J.H. Snider’s presentation on the periodic state constitutional convention referendum at the Unrig the System Summit in Nashville, Tennessee. Hawai`i Free Press publishes J.H. Snider’s critique of Hawaii’s implementation of its campaign finance ad disclosure laws regarding ballot referendums. The Capital publishes J.H. Snider’s proposal to fix Maryland’s gerrymandering problem. Snider has published similar proposals in opeds published in Florida and North Carolina. Hawai`i Free Press publishes J.H. Snider’s critique of both the Hawaii Campaign Spending Commission’s constitutional convention data and how it was reported in the press. Hawai`i Free Press publishes J.H. Snider’s explanation why a constitutional convention, not the State Legislature, is more likely to propose the highly popular reform of legislative term limits. Hawai`i Free Press publishes J.H. 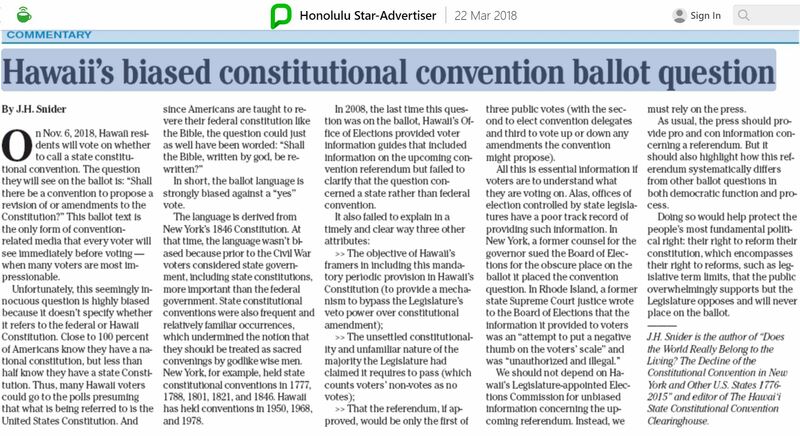 Snider’s critique of Hawaii’s two leading newspapers’ coverage of Hawaii’s Nov. 6, 2018 constitutional convention referendum. Hawai’i Free Press publishes J.H. Snider’s critique of opponents’ framing of the costs of a Hawaii state constitutional convention. Hawai’i Free Press publishes J.H. Snider’s critique of opponents’ framing of the benefits of a Hawaii state constitutional convention. Civil Beat publishes J.H. Snider’s democratic theory lesson explaining the linkage between popular ratification and modern constitutional democracy. Civil Beat cites J.H. Snider’s political analysis of Hawaii’s constitutional convention voting rule specifying that non-votes will be counted as no votes. The News & Record publishes J.H. Snider’s proposal to use a redistricting jury to address North Carolina’s gerrymandering litigation, which has become the highest profile redistricting case in the U.S. Also published in the September 23 edition of the Asheville Citizen-Times. Honolulu Civil Beat publishes J.H. Snider’s explanation of the natural linkage between state legislative term limits and the institution of the periodic state constitutional convention in a state, such as Hawaii, lacking the constitutional initiative. The Washington Examiner publishes J.H. Snider’s critique of K12 public school pension spiking and compensation disclosure in Maryland. The State Constitutional Convention Clearinghouse publishes J.H. Snider’s collection of 42 short essays on the history, democratic function, and politics of the periodic state constitutional convention referendum. The Hawai’i Free Press publishes J.H. Snider’s analysis of more than 80 candidate position statements on Hawaii’s Nov. 6, 2018 state constitutional convention referendum. The Honolulu Star-Advertiser publishes J.H. Snider’s op-ed arguing that, contrary to the messages sent in popular media, the right to meaningfully reform one’s constitution is the most fundamental and precious of all political rights. Honolulu Civil Beat publishes J.H. Snider’s critique of the Hawaii Supreme Court’s decision regarding the majority required to call a state constitutional convention in Hawaii. The Honolulu Star-Advertiser publishes J.H. Snider’s op-ed critiquing the ballot language and other information provided by Hawaii’s Board of Elections regarding upcoming state constitutional convention referendums. The Capital publishes J.H. Snider’s observations about the daunting politics of government official email transparency. Capital editorial cites J.H. Snider expose of due process violations by a school board appointments commission. Honolulu Civic Beat publishes J.H. Snider’s heads up to Hawaii about its Nov. 6, 2018 state constitutional convention referendum. The Huffington Post publishes J.H. Snider’s critique of the federal government’s giveaway of spectrum rights to media plutocrats as it transitions the broadcast TV band of spectrum to mobile broadband service. The Capital publishes J.H. Snider’s expose of due process violations by a school board appointments commission. The Gotham Gazette publishes J.H. Snider’s critique of New York’s November 7, 2017 state constitutional convention referendum ballot. The Albany Times Union publishes J.H. Snider’s explanation of the periodic state constitutional convention referendum as a check on the legislature. City & State publishes J.H. Snider’s explanation of the last-minute barrage of negative ads employed by state constitutional convention opponents. 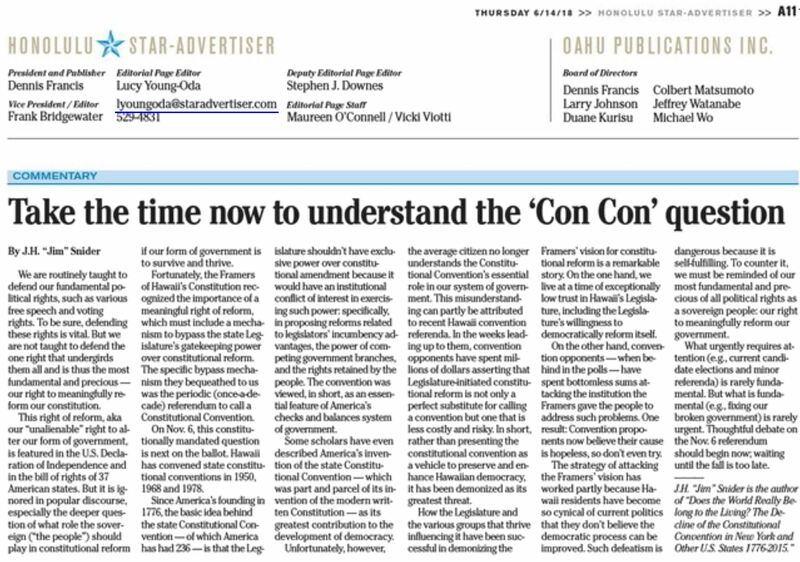 Another version can be found at Dueling Experts, Part II: The Pros and Cons of Con Con, October 25, 2017. The Altamont Enterprise cites J.H. Snider’s analysis of constitutional convention referendum interest group politics. City & State publishes J.H. Snider’s explanation why using New York’s 1967 constitutional convention as the benchmark to evaluate future conventions is misleading. The Wall Street Journal cites J.H. Snider’s explanation for why New York State’s constitutional convention no campaign has been so effective in recruiting retired union workers. Public radio station WNYC cites J.H. Snider’s explanation of the special interest politics behind state constitutional convention referendums. Pros and Cons of a ConCon? The Indypendent cites J.H. Snider’s explanation of the democratic function of the periodic state constitutional convention. The Journal News, part of the U.S.A. Today Network, publishes J.H. Snider’s critique of the argument that the public shouldn’t be trusted to vote on constitutional amendments. The Journal News, part of the U.S.A. Today Network, publishes a video to accompany J.H. Snider’s constitutional convention op-ed analysis. City & State publishes J.H. Snider’s analysis of the comparative resource advantage that no campaigns bring to constitutional convention politics. The Wall Street Journal cites J.H. Snider’s analysis of the politics surrounding New York State’s upcoming state constitutional convention referendum. City & State publishes J.H. Snider’s critique of the opposition’s framing of New York’s upcoming state constitutional convention referendum. Wired Magazine cites J.H. Snider’s critique of the FCC’s fraudulent and unaccountable giveaway of spectrum rights to EBS licensees. Another version of the article was published in the Hechinger Report. The Hechinger Report publishes J.H. Snider’s critique of seniority-based pay discrimination among K12 public school teachers. The Times Union publishes J.H. Snider’s op-ed summarizing his argument in “Does the World Really Belong to the Living? The Decline of the Constitutional Convention in New York and Other US States, 1776–2015,” Journal of American Political Thought, Volume 6 (Spring 2017). The Washington Examiner published J.H. Snider’s argument that K12 public school compensation should be reported using accrual as well as cash basis accounting. The Gotham Gazette publishes J.H. Snider’s proposed agenda for enhancing social welfare provisions in New York’s Constitution. The Journal of American Political Thought publishes J.H. Snider’s account of the evolving politics of state constitutional conventions over a 240-year span. Why is Trump’s ed secretary ignoring the biggest development in education since the printing press? The Hechinger Report publishes J.H. Snider’s call for substantial public policy reform to realize the potential of online, course-based educational choice. The Washington Post publishes J.H. Snider’s call on the Maryland State Department of Education to post on Maryland’s Open Data Portal the salaries and methodologies it uses tally its salary statistics. The Washington Post publishes J.H. Snider’s critique of Maryland government officials’ email policies and practices. This is a shortened version of the op-ed that ran in the online version of the Washington Post on November 11, 2016 (see below). T he Gotham Gazette reprints J.H. Snider’s introductory essay to the symposium published by the Law & Courts Section of the American Political Science Association. The Law and Courts Section of the American Political Science Association publishes this collection of short essays by leading constitutional scholars, with an introduction by J.H. Snider. Covered in the Election Law Blog. The Gotham Gazette publishes J.H. Snider’s critique of New York’s state constitutional convention delegate election process. The Washington Post publishes J.H. Snider’s critique of Maryland’s indifference to the disingenuous email practices of its local government officials. The Gotham Gazette cites J.H. Snider’s critique of New York State’s constitutional convention delegate election process. Joint Committee on Legislative Information Technology and Open Government, as reported in the Committee’s Annual Report for 2016. The Huffington Post publishes J.H. Snider’s explanation of the media’s double standard in covering Hillary Clinton’s email practices. In its lead cover story, Education Week cites J.H. Snider’s critique of Congress’s giveaway of billions of dollars worth of airwaves rights to Educational Broadband Service licensees. Music video based on Woody Guthrie’s “This Land is Your Land” and designed to be a more accessible version of the American Prospect article above. The Washington Post publishes J.H. Snider’s proposal for a legislative bypass mechanism in amending county charters analogous to the periodic constitutional convention referendum for state constitutions. Short course presented by J.H. Snider at the 2016 Annual Meeting of the American Political Science Association, Philadelphia Convention Center, 2:00 pm to 6:00 pm. Covered in the Election Law Blog. The Capital publishes J.H. Snider’s critique of Maryland Gov. Larry Hogan’s appointment of a school board member despite undisputed electoral integrity problems in the formal nomination process. County, Maryland, between an elected and appointed board of education. The Washington Post publishes J.H. Snider’s observation that the Anne Arundel County student council tasked by Maryland statute with nominating a student representative to the County Board of Education violated its own constitution when it did so in 2016. The Capital cites J.H. Snider on the need to webcast critical public hearings regarding local governance. The Maryland Reporter covers J.H. Snider’s public testimony before the Maryland General Assembly’s Government Operations Committee on a bill to require retention of government email records. J.H. Snider’s testimony before the Maryland General Assembly’s Government Operations Committee on bills amending Maryland’s Open Meetings Act (HB984 and written testimony) and Public Information Act (HB492 and written testimony). Medium publishes J.H. Snider’s argument for a new enforcement paradigm for transparency policies concerning government official email. The Huffington Post also published this commentary. The Capital cites J.H. Snider’s critique of a local public body’s public record keeping practices. J.H. Snider’s testimony on legislation concerning Maryland’s Open Meetings Act before the Maryland General Assembly’s Senate Committee on Education, Health, and Environmental Affairs (webcast is here). The concerns he expressed about the retention of public meeting minutes were echoed in a later Capital news article. The Gotham Gazette publishes J.H. Snider’s critique of New York Governor Andrew Cuomo’s proposal to spend $1 million for a state constitutional convention preparatory commission. The Washington Post publishes J.H. Snider’s observation that the Anne Arundel School Board Nominating Commission violated Maryland statute when it nominated to Maryland’s governor four candidates without holding a second public hearing. Covered in the Election Law Blog. The State Journal-Register publishes J.H. Snider’s argument that although a 2-step constitutional initiative is much harder to pursue than a 1-step one, it may be the best way to implement his constitutional reform agenda, which requires bypassing the Illinois Legislature. The State Journal-Register published a letter criticizing the proposal. Bill Daley, former Chief of Staff to President Obama, endorsed the idea in an August 26, 2016 oped. The Hill publishes J.H. Snider’s proposal to deter government officials from misusing private email for government purposes by focusing on the incentives of receivers rather than senders. The New York History Blog reports on both iSolon.org’s constitutional convention history conference on Sept. 24, 2015 at the New York Council for the Humanities and the follow-up event scheduled for Nov. 17-19, 2016 at SUNY Albany under the auspices of the New York State Historical Association. The Sun Sentinel publishes J.H. Snider’s proposal to use a “redistricting jury” to address Florida’s current redistricting morass in particular and the need for an effective independent redistricting mechanism in general. Also published on November 27 in The Palm Beach Post. A more in depth discussion of this proposal can be found in J.H. Snider’s testimony before the Maryland Redistricting Reform Commission. Covered in the Election Law Blog, The Voting News, and FairDistrictsNow.org. The Albany Times Union publishes J.H. Snider’s critique of the New York State Bar Association’s proposal for a preparatory commission to prepare for New York’s Nov. 7, 2017 referendum on whether to convene a state constitutional convention. The Star Tribune cites J.H. Snider’s mixed review of the White House’s We The People petition website. J.H. Snider’s written testimony to the Maryland Redistricting Reform Commission regarding the use of “redistricting juries” to reform Maryland’s legislative redistricting. His testimony was cited in the Maryland Reporter and Baltimore Post-Examiner. iSolon.org constitutional convention history conference at the New York Council for the Humanities. Reported on in the New York History Blog. The Albany Times Union publishes J.H. Snider’s call for a new type of constitutional convention commission to prepare for New York’s Nov. 7, 2017 referendum on whether to convene a state constitutional convention. Covered in the Election Law Blog. The Gotham Gazette publishes J.H. Snider’s call for significant advance preparation, including innovative educational activities, for New York’s November 7, 2017 referendum on whether to convene a state constitutional convention. iSolon.org launches a new website to provide information about New York’s upcoming referendum on whether to call a state constitutional convention. The Baltimore Sun publishes J.H. Snider’s critique of the current framing of the Clinton email scandal, using Maryland’s Public Information Act as a point of comparison. Reprinted in New Jersey Today. A similar critique of Maryland’s email retention policies can be found in Snider’s Maryland’s Fake Open Government, Washington Post, April 18, 2010. Covered by Transparency News. Communications Daily cites J.H. Snider’s filing with the FCC seeking policies to deter price collusion and a massive giveaway of public assets in the upcoming “Incentive Auction” for broadcast spectrum. Snider’s FCC filing was cited in Procedures for Competitive Bidding In The Incentive Auction, August 11, 2015 and Incentive Auction Prohibited Communication Guidance, October 6, 2015. Personal Liberty tracks the history of Congress’s current e-Congress legislation to J.H. Snider’s presentation on that subject at a Congressional caucus meeting shortly after 9/11. A CRS report from 2002 noted Snider’s contribution to this discussion. The Capital publishes J.H. Snider’s analysis of how school administrators have compromised the election of the student member of the Anne Arundel County Board of Education. The Capital publishes J.H. Snider’s analysis of the power struggle over membership in both the Anne Arundel County Board of Education and the commission that nominates its members. The Capital publishes J.H. Snider’s critique of the school governance system in Anne Arundel County, Maryland, including his recommendation for executive branch appointment of the superintendent. iSolon.org working paper by J.H. Snider on how to improve the Achilles’ heel of the constitutional convention process, the enabling act. J.H. 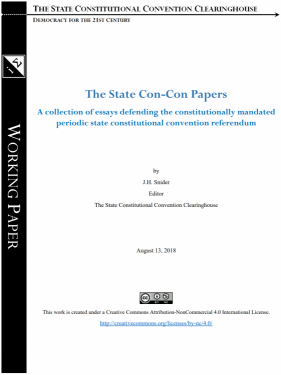 Snider’s assessment for RhodeIslandConCon.info of the outcome of Rhode Island’s November 4, 2014 Referendum to Convene a State Constitutional Convention. Covered in the Election Law Blog. The Warwick Beacon publishes J.H. Snider and Beverly Clay’s critique of a set of state constitutional convention historical arguments being widely published in local Rhode Island newspapers. The Providence Journal publishes J.H. Snider and Beverly Clay’s critique of campaign finance claims made in the current advocacy campaign over convening a constitutional convention in Rhode Island. Covered in the Election Law Blog. The Valley Breeze publishes J.H. Snider and Beverly Clay’s critique of arguments concerning the November 4, 2014 state constitutional convention referendum that have been widely published in Rhode Island local newspapers. GoLocalProv publishes J.H. Snider’s satire on the constitutional convention debate currently taking place in Rhode Island. The Providence Journal publishes J.H. Snider and Beverly Clay’s critique of Rhode Island’s 2014 Voter Information Handbook and proposal for a different method of providing such information. Covered in the Election Law Blog. The Milwaukee-Wisconsin Journal Sentinel cites J.H. Snider’s comments on the significance of politician plagiarism. The Providence Journal publishes J.H. Snider and Beverly Clay’s critique of Rhode Island’s Bi-partisan Preparatory Commission to provide information to voters about Rhode Island’s upcoming state constitutional convention referendum. Covered in the Election Law Blog. iSolon.org launches a new website to provide information about the fourteen U.S. states with periodic constitutional convention referendums. T he Providence Journal publishes J.H. Snider and Beverly Clay’s critique of Rhode Island’s state constitutional convention campaign finance disclosure laws. Covered in the Election Law Blog. J.H. Snider’s proposal in the form of a video to empower citizens to hold their representatives accountable by using new information technology to improve the linkages between existing government databases incorporating conflict of interest related data. The Atlantic Monthly cites J.H. Snider’s analysis of the democratic function of the White House’s We The People petition website. The Providence Journal publishes J.H. and Sage Snider’s op-ed providing a historical, political, and democratic analysis of Rhode Island’s November 4, 2014 referendum to convene a constitutional convention. On March 23, 2014, the Sunday edition of the Providence Journal ran a letter commenting on this op-ed. J.H. Snider’s op-ed in the Baltimore Sun on the proper role of the judiciary in limiting voters’ ability to choose among political candidates. Covered in the Election Law Blog. On March 26, 2014, the Maryland Court of Special Appeals ruled in agreement with the analysis in this op-ed. J.H. Snider’s luncheon presentation sponsored by the Harvard Journal of Law & Technology, Harvard Law School, Cambridge, Massachusetts. The presentation includes a Powerpoint and webcast (compatible with Apple’s Quicktime). J.H. Snider writes two commentaries in Eye on Annapolis illustrating the dismal politics of employee compensation transparency in his local school district. See School Board Pays Maxwell $4,582/Day In July; Maryland Taxpayers Pay Perkins $410,018 Signing Bonus on Top of $249,735 Annual Salary and Maxwell’s Unreported $1 Million Signing Bonus with Prince George’s County, Courtesy of Maryland Taxpayers. J.H. Snider describes the potential for abuse in an obscure type of election: for student members of boards of education. In Maryland, more than half the population lives in a school district with a student member of the board with at least partial voting rights. Covered in the Election Law Blog. Eye on Annapolis publishes J.H. Snider’s Sunshine Week 2013 commentary critiquing the lack of sunshine at the Maryland’s election board. Covered in the Election Law Blog. The Baltimore Sun publishes J.H. Snider’s op-ed on the inequitable enforcement of election law in Maryland. J.H. Snider’s testimony before the Maryland Senate’s Committee on Education, Health, and Environmental Affairs concerning how to make the Anne Arundel County Public School System more democratically accountable. The Atlantic Monthly cites J.H. Snider’s comments on the White House’s We The People petition website. Education Week publishes J.H. Snider’s commentary on the need for greater transparency concerning public K12 school bus schedules. Reprinted in the February issue of School Transportation Director. MarylandReporter.com publishes J.H. Snider’s commentary critiquing the procedures of the Maryland State Board of Elections. J.H. Snider’s prepared Testimony concerning needed reforms to Maryland’s Open Meetings Act before the Maryland General Assembly’s Joint Committee on Transparency and Open Government. Covered in the MarylandReporter.org‘s Committee asks for recommended changes in Open Meetings Act, October 18, 2012, and Joint Committee’s 2012 Interim Report. iSolon.org and Maplight.org launch a new website to track referenda on Maryland’s November 6, 2012 statewide ballot. The website provides voters with one-stop access to nonpartisan information about the statewide referenda. For Maplight’s election wrap-up for VotersEdge.org, see Fall 2012 Newsletter. The Huffington Post publishes J.H. Snider’s 1st year report card on the White House’s We the People petition website. Covered in Benton Headlines, Liberal Roundup, and the Deliberative Democracy Consortium’s December newsletter. Responded to in White House press release. J.H. Snider appointed a non-residential Lab Fellow at Harvard University’s Edmond J. Safra Center for Ethics for the 2012-2013 academic year. TRDaily cite’s J.H. Snider’s critique of the NTIA’s open government practices. The print edition of the Washington Examiner publishes J.H. Snider’s commentary, How to fix Maryland’s D-minus in corruption, arguing that convening a state constitutional convention is the most politically realistic way of addressing a certain class of democratic reform issues where incumbent legislators have a blatant conflict of interest in proposing and implementing reform. Patches in Anne Arundel County, Maryland, publish J.H. Snider’s commentary explaining the different press incentives for covering Maryland’s Congressional versus General Assembly redistricting. J.H. Snider’s Huffington Post article critiquing the National Telecommunications and Information Administration’s management of spectrum, including its culture of secrecy. Roll Call cites J.H. Snider’s critique of the broadcast auction legislation passed by Congress. J.H. 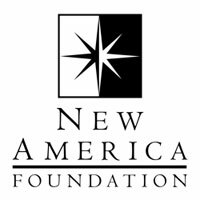 Snider’s Huffington Post article critiquing the spectrum giveaways contained in the fine print of the recently passed Congressional legislation promoted as extending the payroll-tax cut for the middle class. The print edition of the Washington Post publishes J.H. Snider’s commentary arguing that the Maryland General Assembly has a conflict of interest in solving the gerrymander problem, which is the type of democratic reform problem constitutional conventions were invented to address. It is covered in the print edition of the Washington Post‘s letters-to-the-editor, and by the Campaign for a Stronger Democracy, The Media Briefing, and the Benton Foundation. The Capital cites J.H. Snider’s testimony calling for more local electoral transparency before the Maryland General Assembly’s Senate Education, Health and Environmental Affairs Committee. The Severna Park Patch publishes J.H. Snider’s written comments to the Governor of Maryland’s Redistricting Advisory Committee regarding the transparencyt of its proceedings. The Center for Technology Innovation at the Brookings Institution publishes J.H. Snider’s paper on why the politics of using unique identifiers to track powerful political players across government databases may be less dismal than widely believed. The Open Government Coalition gave it the lead spot in its weekly newsletter. It was also covered in the U.K.’s Great Emancipator, the Campaign for a Stronger Democracy’s December Newsletter, and American City & County‘s December Newsletter. Soaking the Rich in Obama’s Jobs Plan? Its multi-billion dollar spectrum giveaway undercuts the president’s populist message J.H. Snider’s article, published in the Huffington Post and reposted on the Wall Street Journal‘s blog, criticizes the tacit spectrum giveaway contained in the American Jobs Act of 2011. TR Daily reports on the article. Inside Retail cites J.H. Snider and Terra Ziporyn’s 1992 book (Future Shop: How New Technologies Will Change The Way We Shop and What We Buy, St. Martin’s Press)as a landmark in the emerging field of ecommerce. Similar recent press: Spark of Hope and The History of Online Shopping in Nutshell. The Center for Technology Innovation at the Brookings Institution publishes J.H. Snider’s paper on the need to rethink public policy regarding local public media, especially the design and use of public meeting rooms. The paper is covered in the the Deliberative Democracy Consortium’s newsletter and National Coalition for Dialogue and Deliberation’s monthly update. J.H. Snider appointed a non-residential Network Fellow at Harvard University’s Edmond J. Safra Center for Ethics for the 2011-2012 academic year. The annual report can be found here (search for “Snider”). Stateline cites J.H. Snider on state constitutional conventions. Governing Magazine runs the same story. ‘Troublemaker’ fights secrecy in government The Capital (Annapolis, Maryland) publishes an article on J.H. Snider’s local open government efforts. A hotbed of techie agents of government transparency The Washington Post cites J.H. Snider on the recent “TransparencyCamp” held in Washington, DC. The Baltimore Sun cites J.H. Snider’s Baltimore Sun op-ed in describing the Maryland Senate’s debate over SB26: Maryland Constitutional Convention – Sense of the Voters. J.H. Snider presents his arguments on how the open government public policy debate should be framed at this two-day workshop sponsored by Princeton University’s Center for Information Technology Policy. The video of Snider’s presentation begins at 38:00. The Baltimore Sun publishes J.H. Snider’s op-ed on Maryland’s 2010 ballot item to call a constitutional convention. Free Press’s SaveTheNews.org includes iSolon.org’s comments in its roundup of comments submitted for the Federal Trade Commission’s workshop on the future of journalism. Paper presented at the Representation and Electoral Systems Division’s theme panel, Citizens’ Assemblies and Deliberative Democracy, at the Annual Meeting of the American Political Science Association, Toronto, Canada. Harvard’s Nieman Watchdog publishes J.H. Snider’s article arguing for the development and implementation of a Bias Modeling Language to automate watchdog journalism. This article launches iSolon.org’s BML Semantic Web Project. This special edition of iSolon.org’s Citizens Assembly News Digest provides an analysis of the referendum results on the recommendations of the f British Columbia’s Citizens’ Assembly on Electoral Reform. Education Week, the leading trade publication in K12 public education, publishes J.H. Snider’s commentary on how to use new information technologies to democratize public access to school budget data. The Journal of Information Technology & Politics publishes the final version of J.H. Snider’s working paper researched during the Spring of 2008 while Snider was a Fellow at the Harvard Kennedy School of Government’s Shorenstein Center on the Press, Politics and Public Policy. J.H. 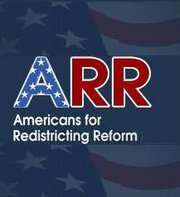 Snider’s Working Paper presented at the Hudson/iSolon conference on redistricting reform. The latest issue of iSolon.org’s Citizens Assembly News Digest. The Center for Media and Democracy’s PR Watch publishes J.H. Snider’s article on the ethical tensions in a successful, state-of-the-art, public policy think tank. The Washington Examiner publishes J.H. Snider’s commentary on the politics of the recently passed digital TV legislation. Politico publishes J.H. Snider’s commentary on the need for better public disclosure of think tank ethics and ethical conflicts. Authors Guild backinprint.com reprint of the J.H. Snider and Terra Ziporyn book on e-commerce published by St. Martin’s Press in 1992. 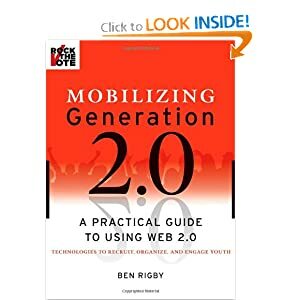 The book features a new preface analyzing the growth of e-commerce during the past two decades and forecasting that the changes in the consumer marketplace over the next twenty years could be even greater. In the November/December issue of the Columbia Journalism Review, Michael Schudson and Danielle Haas report on J.H. Snider’s “Would You Ask Turkeys to Mandate Thanksgiving?” On May 11, 2009, the Columbia Journalism Review followed up with another story on the same topic, Senate Goes XML: A quiet shift is hailed. The Shorenstein Center on the Press, Politics and Public Policy publishes J.H. Snider’s Working Paper #1. Published in the Journal of Information Technology & Politics, May 2009. The Shorenstein Center on the Press, Politics and Public Policy publishes J.H. Snider’s Working Paper #2. The Journal of Public Deliberation publishes J.H. Snider’s concluding remarks at the Harvard University Canada Program’s conference on democratic deficits and citizens assemblies, May 8-10, 2008. Online contract access would let in more sunshine In an editorial, the Capital (Annapolis, Maryland) cites J.H. Snider’s critique of government databases that are not integrated with each other. In a front page story, the Capital (Annapolis, Maryland) cites J.H. Snider’s critique of government databases that are not integrated with each other. The Ottawa Citizen quotes J.H. Snider, in a front page story, on the significance of Ontario’s experiment with a citizens assembly. iSolon.org policy brief prepared for the workshop, “Toward More Transparent Government,” held at the National Academies of Science on June 19, 2007. J.H. Snider’s book review essay tracing the history of the citizens assembly proposal from Dahl’s 1970 After the Revolution (Yale University Press) to O’Leary’s 2006 Saving Democracy (Stanford University Press).